After an eight-year hibernation from feature films, writer/director Harmony Korine, christened “the future of American cinema” by Werner Herzog, has finally finished his third film, Mister Lonely. Although the young filmmaker has been out of the spotlight for some time now, it hasn’t stopped him from keeping busy with other artistic endeavors, often bending the rules with his unique, eccentric style. Harmony Korine was raised in the carnival. As a teenager, he lived with his grandmother in the boroughs of New York City, and after dropping out of the film school at NYU, pursued a career as a professional skateboarder. It was at Washington Square Park where Korine met photographer Larry Clark while skating with friends. The two hit it off right away, feeding off of each other’s fascination with painful stories of teen angst. When Korine showed Clark a screenplay he had written about a teenager whose father takes him to a prostitute, the photographer had a more interesting idea for the inspiring writer: to compose a script based on his everyday life. So in three weeks, Korine wrote his first feature (at the age 19), Kids, directed and photographed by Clark. The film had grand success at festivals around the world and was hailed by critics as a serious “wake-up call” to America. In 1999, his second feature film was released, Julien Donkey-Boy, starring friend Werner Herzog and then-girlfriend Chloe Sevigny. It was the first American film to be certified as Dogme ‘95 and was very successful at foreign festivals. This surreal portrait paints a morbid picture of a dysfunctional family, mainly featuring a schizophrenic boy remarkably played by Scottish actor Ewen Bremner. In April of 2005, Korine visited Ryerson University for a two -and -a -half -hour interview conducted by filmmaker Bruce LaBruce. After discussing his more prominent work, they started to talk about some of the side projects the young director had been working on in the past years. One project, cryptically named The Diary of Anne Frank Part II, was an experimental video triptych which included a mixture of horrific found footage. The museum-intended film was released in a few cities for short periods of time, disgusting critics and creating hysterical anger in a majority of the audience. It was around 40 minutes in length, including images of a mentally handicapped man in a soiled diaper and the burying of a dead dog. 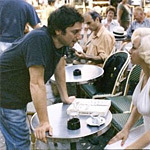 In the interview, Korine expressed his pleasure of being involved and collaborating with musicians for music videos, the most popular being Sonic Youth’s “Sunday”, starring Macaulay Culkin and his then-wife Rachel Miner. Edited suitably with the music, this video is comprised of many slow motion shots of the two dancing and sticking their tongues out at each other. He also collaborated with bluegrass artist Bonnie ‘Prince’ Billy, making a video for the song “No More Workhorse Blues.” This collection of images is exceptionally stunning; showing a painted-black bride, walking in a slum, dancing with vagrants, eating a Popsicle, and eventually hanging herself from a tree. Korine’s most shocking project was an abandoned film entitled Fight Harm. As unsettling as the premise is, you have to respect the devotion: Harmony walks up to real people on the street and starts a physical confrontation with them, and with someone filming in the shadows, he would be beaten unconscious. Although his previous projects show lots of promise in a future career of contemporary experimental films, Korine has decided with his latest composition to go the opposite direction; he’s taken his clever, yet explosive imagination and has created a straight-narrative movie. In Mister Lonely, Korine tackles fame and identity, finding a beautiful, human core to his characters who impersonate celebrities for a living. Korine has come a long way since Kids, but in keeping with his style of clever irony and dark beauty, it may look like he has taken a more serious turn with this latest opus. Mister Lonely seems like an almost perfect addition to Korine’s filmography, and should no doubt assert him as a matured filmmaker.